Mass transit in Cincinnati has been around for 124 years, but the service provided by Metro is still 40 years young. The first buses in the Queen City arrived in 1926 and had grown in popularity by the 1960s. During this time, it was managed by a private company named Cincinnati Street Railway. 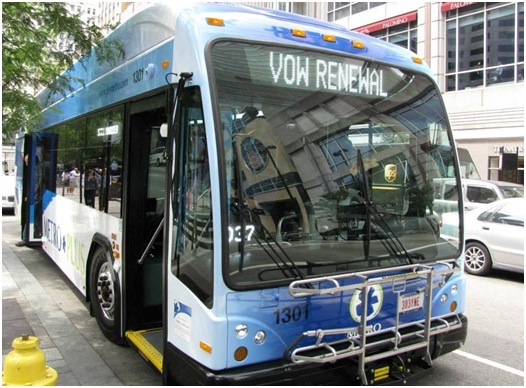 In 1973, the City of Cincinnati and Southwest Ohio Regional Transit Authority (SORTA) partnered to establish Metro in order to improve ridership and the quality of the buses. It was then Metro became the city’s first publicly owned and operated transportation system. After meeting on Metro’s first day of service 40 years ago, Captain Rex and Anita Settlemoir renewed their wedding vows on Thursday. Photograph by Paige Malott for UrbanCincy. To celebrate their 40th anniversary, Metro hosted an afternoon of festivities on Fountain Square. Four buses were displayed along Fifth Street, including a vintage Cincinnati Street Railway bus which had been preserved by the Cincinnati Transit Historical Society. Local vendors Queen City Bike, Cincinnati and Hamilton County Public Library, Cincinnati Parks, and the Transit Authority of Northern Kentucky (TANK) handed out freebies while Binny and Buddy, mascots for Rumpke and Hoxworth Blood Center, entertained the crowd. Metro’s booth even featured a spin-the-wheel game were participants could win an assortment of products from Metro including hand sanitizer, tote bags, or miniature model Metro buses. “We’re celebrating 40 years of connecting people and places, supporting economic development and improving the quality of life in Greater Cincinnati,” announced Terry Garcia Crews, CEO of Metro. In addition to celebrating the organization’s anniversary, a local couple celebrated their 40th anniversary as well. Captain Rex and Anita Settlemoir met while riding Metro in during its first year of service. 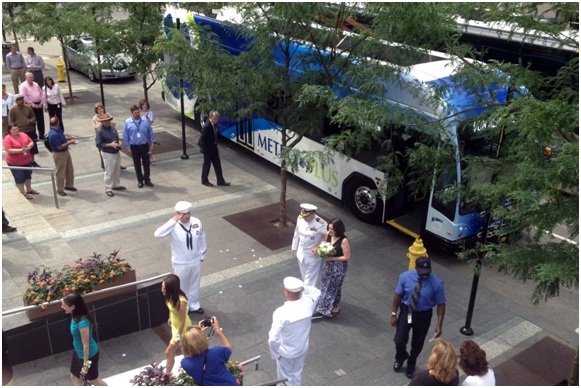 The Settlemoirs took part in a wedding vow renewal and were escorted to Fountain Square by a Metro*Plus bus; the newest vehicle introduced to the fleet. “You could just hear the love and see it in their eyes,” smiled Jill Dunne, Public Affairs Manager for Metro. With 40 being the new 20, the city wonders what’s next for Metro. Next articleWill Janette Sadik-Khan and Amanda Burden form their own urban planning policy institute?